Today's Top 10 is a guest post from software developer and Harmoney Delivery Lead, Justin Soong. Views are his own. As always, we welcome your additions in the comment section below or via email to david.chaston@interest.co.nz. 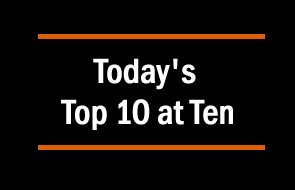 If you're interested in contributing the occasional Top 10 yourself, contact gareth.vaughan@interest.co.nz. 1. The left wing implosion? The late American liberal philosopher, Richard Rorty, seemed to have a Nostradamus-like prophesy on the rise of the populist right and the implosion of the left, 20 years before November 8th 2016. He chronologically splits the left wing movement into two camps; the “reformist” and the “cultural” left, and asserts that this continuing rift has led to a disastrous outcome for left wing politics in America. One can’t help but ask if similar parallels exist in NZ. Labour is still struggling to find its identity post Helen Clark, and seems to be caught in a very “reformist” vs “cultural” divide. All the while National (yes even Bill English) are creeping further past the center, into policy territories traditionally held dear to progressives. Automation and machine learning are leading us to the dystopian “Skyne” we’ve been dreading since watching Arnold Schwarzenegger in the Terminator. Computing power is now harnessed in our very own “Skynet” - the “cloud” - and is replacing humans at a rate of knots. Even the grandmasters at Goldman Sachs are not immune, replacing their equity traders with engineers over the last decade. What a time to be living in. But it begs the question of our education system and workforce, are we ready for the bots? Long story short, Peter Thiel can spot a great deal from a mile away, while the NZ government can’t spot a bad deal if it tried. Economist Eric Crampton differentiates his stance between Thiel’s citizenship and the poor government decision. A path has appeared where Apple management can realistically buy back 50% of AAPL's outstanding shares within three years. With a stable iPhone business, a growing Services business, and U.S. corporate tax reform, Apple will have close to $300B of cash available to spend on share buyback in the coming years. The numbers are daunting, and as Apple management has shown no sign of curtailing its buyback plans, it's time for Wall Street to take notice. Pretty impressive cash holdings to have such an option in the next three years! The Listener’s Jane Clifton describes the announcement of the National Party’s first avowedly gay MP, Paul Foster-Bell, as one of 2016’s political milestones. A conservative party, with first outwardly gay MP… oh how times have changed. A very insightful interview into an up and comer of the National Party rank and file. David Rubenstein speaks to Warrant Buffet. The “Sage of Omaha” reveals he probably spends more time on the computer than Bill Gates because he plays 12 hours of online bridge a week under the name ‘T-Bone’, against his arch nemesis ‘Sirloin’, a woman from San Francisco. Buffet also shares his approach to investing, his optimism for America, and recollects the first time he met Bill Gates. I love how one of the worlds wealthiest individuals, knows how to take time out for a bit recreation in the most modern of ways. While there is massive debate on immigration and refugees all around the world, few have considered the impact a certain group of immigrants and refugees have had on history. Albert Einstein, who as a Jew couldn’t return to his Berlin home, averted a disastrous narrative for the free world. He signed a letter to the US President, warning that Germany might develop atomic bombs and suggesting the US start its own nuclear program. It prompted action by Franklin Roosevelt, which eventually resulted in the Manhattan Project developing the first atomic bombs. This PRI podcast tries to answer two big questions, how have immigrants changed innovation in America, and what does America stand to lose if immigrants are prevented from settling down? A good trip down memory lane, and a few lessons for the America of today. A great rebuttal to any opponent of immigration and refugees. “Think Big”, “Make NZ Great Again” and NAFTA… Tyler Cowen of Bloomberg discusses NZ’s experience with a populist strong man leader, Robert Muldoon. Cowen points out some uncanny similarities with Donald Trump, in character, policy and perception. We too had a “Trump”, and we didn’t turn out too badly 30 years later, or did we? As a software developer, I get approached by every man and his dog with their next game-changing app idea. It starts getting a bit noisy when it comes to spotting the next TradeMe or Xero. Christian Sepulveda has come up with a quick and simple test to help him organise his thoughts when assessing opportunities, which he calls The Fields of Dreams test. The test focuses on three areas, user pain, user experience, and economics. I think it’s pretty nifty. The left is imploding because they are indifferent to the concerns of the majority of people. All they seem to care about is LBGT+ issues and gender liquidity. Fine, but how does that put food on the table? The left is becoming more and more like the liberals of the 19th C. Allegedly there to represent the working class but became so disconnected to them that they ceased to have any relevancy. Interesting there about the immigrant Albert Einstein contributing greatly to the US especially to the development of the atomic bomb - although I think a world without nuclear weapons would have been better. But it should also be remembered that it was another immigrant that started WWII. Can we actually agree that immigration has its pros and cons? The left are imploding because they are so entrenched in gender and race politics. The righteous liberals among them are, ironically, hopelessly blinded by the pursuit of persecuting the white male and campaigning on a basis of inequality. In order to survive, unlike the right, they require these very factors of gender and racism for their existential moral superiority. So, essentially, they are incentivised to perpetuate inequality. Luckily, more and more people are able to see the absolute hypocrisy that is associated with such a position. The most abhorrent factor is that they are incapable of even hearing differing viewpoints to their own and all the media coverage is centric around their stylised, idealised perception on how things should be. If you have ever tried debating a lefty liberal on facts, it is a mind numbing experience. Totally agree. Even worse for the left is that the "commissars" are demanding more and more ideological purity and purging anyone who disagrees even in the slightest. The left knows the sins of all but can never forgive - Willie Jackson still apologizing over an interview three years ago is a good example. People vote for personal interest, who is going to make the most positive difference for them. And elections are won by persuading "the bulging middle" to vote left or right, lefties or rightists will vote their side whatever the opposite says. The left have lost the battle for the middle for the moment, which mainly revolves around competent economic management, lower taxes, decent health education & superannuation. The middle don't like being lectured and they're not overly interested in minority interests, they're not on welfare, they want to see competence in the economic management of the country/taxes. The parties on the right project this image to voters but their true interests are those of their corporate backers and government policy is aligned to maximise their interests and to stifle any opposition or "progressive" policy to govern in the public interest. Most of their voters don't see it or are powerless to change this as the Left doesn't look the part. All they seem to care about is LBGT+ issues and gender liquidity. I've been reading a lot about post-modernist movements recently, and they strike at the core of the issues in the left. Class-based warfare, deconstruction of truth and irrational (and often destructive) viewpoints. I tend to identify with the left, however, what the left originally stood for, rationality, equality and science have increasingly deteriorated (and in many cases are now completely inverted). A strong and recent example is how the left are now unwittingly those arguing to restrict freedom of speech in order to 'protect' those who are marginalized. If there's anyone with an identity problem, it's themselves. With the demise of authoritarian regimes in the last century, particularly on the right, I'm afraid the extremist positions on the left are no longer being moderated, and are in fact co-opting ideas from various failed regimes, intentionally or not as ideologues. From looking at recent history of philosophy, the left are facing a existential and nihilistic nightmare, both figuratively and literally. All bets are off, so expect absurdity from any direction. Where would Trump be without Immigration....Single....no Kids. All 3 wives were Immigrants. Selective stupidity, knows no bounds.? 3 x times a loser...if his latest wife, gets sick of being...scorned, reviled and replaced..for a new Model..
She may have relished the chance of being a Rich Mans Poster Girl, cut into shape to suit Trump, then being a Presidents Wife....but from what I have seen and heard, that novelty is wearing a bit thin. Suffering Fools..gladly, may be OK when first bought to the USA...and re-modelled....maybe she will find true love............................eventually. And I would not blame her....one inch...At least she would not lose face....if she did.?? What you point out is true , but we need to be careful about religious judgement. Christians have not been a bunch of Angels over the Centuries. I worked with Muslims in Central Africa ( both African and folk of Middle Eastern ethnicity ) in a formal business environment while working for a Multinational Bank . They are basically good hardworking people following their faith and beliefs , often more devoutly than Christians do. No 5 - Christopher Finlayson has always been openly "gay" and a Catholic to boot. Regrettably the left has lost its way . I am still waiting for a workable housing policy from anyone, before I make a decision to vote in the election and Labour is the most likely to produce one . Commenter on that thread makes an apt comparison too: John Key as the Captain of the Costa Concordia. After eight years of kicking various cans down the road and escalating crises, he's been the first off the boat before it all sinks. Boatman how about you read the above MacroBusiness article. Read Labour's comprehensive housing package. http://www.labour.org.nz/housing and read Andrew Little's speech to the Property Council's Residential Development Summit http://www.labour.org.nz/andrew_little_speech_to_the_property_council_s_... and then tell us where the gaps are in Labour's proposed policy reforms? What else do you think they should be doing to make their housing policies more workable? Which both share the same ideological claims. And that competing ideologies outside this globalist/centrist dominant ideology include national-populism, religious fundamentalism, new localisms, global justice movements, etc.. I find it an interesting frame from which to evaluate different things politicians raise. Yesterday, with respect to the Cadbury announcement, Winston Peters was the only politician that I saw commenting on the negative effect of globalisation (i.e., the overseas-owned company has no consideration for local jobs or in-country history) with a competing ideological message of new localism (i.e., use your power as a consumer to purchase a locally manufactured product instead). NZ First has normally been portrayed as being at the "centre" of NZ political ideology (i.e., somewhere between Labour/left and National/right), whereas under this framework introduced by Steger - Labour and National are at the globalist centre and NZ First are right of that centre (i.e., either national-populist or new localism). Politicians from both National and Labour were quick to excuse Mondelez, expressing sadness about the closure but accepting it as inevitable. What happened to the Labour Party that stood up for ordinary people? Why is no one organising a protest, or threatening political consequences for Mondelez's enablers? Why does no one suggest that it might not be a good idea to meekly submit to an economic order that amply rewards the most fortunate of our society but punishes those without the privilege of advanced educations or access to enriching social connections? But in general globalisation was a system wide response to a rising energy cost in the process of extracting energy. Since this energy cost underpins all goods, manufacturing was shifted to where labour was cheaper and environmental controls were more lax (or in this case to where more end consumers were to avoid freight) ... this helps (temporarily) to keep the growth Ponzi turning. The closure is inevitable, unless you want everyone to pay more for their (Cadbury) chocolate ... which reduces demand and relative competitiveness .. catch 22. Profitability & wealth cant be protested or voted in. Closure was not inevitable ham n eggs. If it was locally owned it would be open and thriving. Dunedin has young thriving tech businesses. Say Escea or Scott tech. They will thrive, be sold with all the protective promises then move in a few short years. So in a way I agree with you, once the mulinationals get them it is inevitable. Lets stop selling them. These are very viable enterprises right where they are. Firstly, Cadburys was always a foreign MNC brand. It has never been NZ owned. Secondly, maybe a core reason they can't hack it in New Zealand is that there are local businesses undermining their position. Porirua-based Whitakers, for example, which is thriving. If you are right and there are Dunedin-based skills and talent for a product that is still in demand, you or some other entrepreneur will jump in and harness that opportunity. After all, in the way that Mondelez is leaving, you will not have to pay any goodwill for all that they are leaving behind. And then it would be locally owned. It is not as though there is any lack of capital for good profitable ideas in Dunedin. The 'Southern Mafia' have plenty, and Queenstown is a thriving investment banking centre after all. Of course, if Mondelez is right and the whole idea of making FMCG chocolate in Dunedin is unsustainable, then there will be no phoenix. A long-used piece of conversational shorthand for wealthy Otago/Southland families. Often centered around the influence of Forsyth Barr. Bit short on your history there DC. Richard Hudson started in Dunedin in the1860s and the family was only taken out by Cadbury (the MHC) in 1930. Well "merged" Cadbury Fry Hudson. Hudson family still around. The "Tartan Mafia" is a bit of an 80s story. Too colourful a title for some to let go. But it is true there is money here to be invested. Auckland pales in comparison on wealth. But Dunedin really works for the young entrpreneurs. Engineering but more recently IT. The said thing is as they grow into success -say 200 staff - its sold and shipped out. Hard to see the solution - culture perhaps - Denmark apparently does well with big companies retained in family ownership. Then it's off to Wanaka with the loot. Wanaka is where it is at. Queenstown is for the riffraf. Underlying problems are the same as for all New Zealand including a chronic balance of payments deficit. Ive ive also seen comment about the german machine that it has a low corporate tax rate that allows retained earnings and very wealthy families who cling to the businesses, think Porsche. May be other reasons of course. Dc. You hold faithfully to the standard narrative of capital deployment when that's not working. Seems to me to be a version of the much quoted "tragedy of the commons" where communal ownership and the associated motivations let individuals destroy the wealth othe rest. Seems to me the multi national in Dunedin happily destroys the wealth of the locals. I'm going to call it " the tragedy of remote ownership". You support it DC - but so did many stuck in the "commons" thing. Do any common taters here care to suggest an improved name over "tragedy of remote ownership"
In accordance with Steger (the author linked above) if you are looking for a political ideology in opposition to the "tragedy of remote ownership" - either the global justice movement (left of globalism - our present centrist ideology) or new localisms (right of our present centrist ideology). For awhile now, I have been of a mind that the old axis of left vs right based on the spectrum created during the industrial revolution were now wholly out of date to define the current state and needs of modern politics. Globalisation (multinationals, and the related have and havenots) that is the new axis. Likewise I don't see winston commenting about every job created by globalisation. #7. The issue is not "immigration" or refugees. Wrong word that. It's about what is the desirable number for total population. With a stable population we would still have inflow and outflow at the border. I tire of both the pro and anti immigration rhetoric. Like so many things in the modern work, things simplified to dualistic, polar extremes when a wide spectrum of options exist. It's also not necessarily immigration that's the problem, as much as foreign purchases a la Vancouver. Short term thinking is seeing NZ being sold out from under Kiwis, to both legal and laundered money flooding in from overseas. In a short time, there'll be little left here for young Kiwis to bother with. Why stay in Auckland for high costs of living, stratospheric housing costs, and low incomes? There will be another brain drain, leaving behind the oldies and their foreign buyers who have poverty-level incomes declared in NZ, just as has been happening in suburbs in Vancouver. I predict a flight from Auckland over the next 5 years. I reckon a lot of baby boomers will flee - fearful of intensification + able to cash up and buy in the regions. In 5 years, Auckland house prices at best similar to now. If there’s any point in U.S. stock market history, next to the market peaks of 1929 and 2000, that has deserved a time-stamp of speculative euphoria that will be bewildering in hindsight, now is that moment. Perhaps there’s room for this burning wick to shorten further, but across every effective, value-conscious, historically-informed classification method we use, the estimated downside risk of the market overwhelms its upside potential. The chart below shows monthly candlesticks for the S&P 500 Index since 1996, including the tech bubble and collapse, the Fed-induced mortgage bubble and collapse, and the speculative first half of the current, wholly uncompleted cycle. I believe the equity market now faces the likelihood of deeper losses over the completion of this cycle than any other in history, save for the collapse that followed the 1929 peak. Interesting article. I would be interested to know how his funds are structured given this view. Has he gone short of the market? As a NZ dividend focused investor,I have been cautious of the market for some time and have made efforts to reduce my portfolio's overall earnings multiple. I have also raised my cash weighting,but I intend to stay more or less fully invested,in the expectation of riding out the coming storm. If all my paper gains go,that doesn't really bother me and a 20/30% fall in dividends is bearable,though certainly unwelcome. I have lived through a good few crashes and hope to survive the next one. There is no guarantee cash would be unscathed when your 'coming storm' hits. In the end, those who are dependent on dividends for income have little choice than to remain reasonably fully invested. Unless they are willing for a time to consume capital and watch the storm front possibly pause for who knows how many years while the relative value of their equity erodes. Like you I've survived the GFC and other corrections. A worry is the world could nosedive and not recover from the stall next time but living in constant fear of black swans is not really my thing. Talking about 'immgrants' without applying a leetle judgement is like talking about the USA or Australia (federations, both) as though they are a single country. The diaspora from Germany post 1933 and a modern equivalent - the flight of Vietnam's professional class post the American withdrawal - certainly benefited the receiving nations. But in equal and opposite senses, impoverished the emitting nations. It's taken 30+ years for Vietnam to recover even mildly from the Boat People exodus, and it took the Marshall Plan to get Germany back on its feet: there were a hard 5-7 years immediately post '45. Which points out the bleedingly obvious: it depends what type of character, capacity and collateral (to use the old Bankers' yardsticks) a nation chooses to let in. Again to state the obvious, if those three-C's are not immediately apparent, then to judge the likelihood of them being achieved quickly enough for a positive contribution to be hoped for. So, citing top-of-the-class Jewish academics from the '30's is not exactly a useful guide to current immigration settings. Thanks Kate. Stegler. Humm. First he has this US centric view. Hardly a world view. He notes some deficiencies but does not seem to realise globalism views markets and democracy as something to be eliminated. Despite claims to the contrary. The last thing big business wants are markets. Localism is explained in political terms only but not for business. Nothing about "the tragedy of remote ownership. I think I will follow the 'cultural differences' idea - not the political one. Do some reading about Demark, Germany, China and see just how their viepoint on ownership differs from ours. Best economic insight I hold to is from Marx - ultimate benefit always flowed to the owner.